Save the date: There will be a third meeting of the Historic Preservation Commission on Monday, May 6, at 7:30 P.M. It is very important that you go to the meeting to be seen and heard. Let the town know that you want the theater saved. Welcome to the homepage for Save Madison Theater. SMT is a community founded, grassroots organization that is advocating to save and preserve the civic and cultural landscape of Madison, New Jersey. For over 90 years the Lyons Theater on Lincoln Place has been a key contributing building in the cultural life of countless residents! From creating memories of a first date to everyday moments like seeing the latest film, the Lyons Theater has an important place in Madison. The theater has played a role not just in the lives of residents but of visitors and the business community as a whole. The theater helps make Madison Madison! Sign the petition! (note that the fund raiser on the next page is for the hosting of our petition, not us – so don’t donate unless you really like supporting ipetitions. We’ve lived in the area for 10 years and this theater is special, serving as a cultural and social hub for residents. Please preserve the theater! Took my girlfriend there on special dates. Now married 48 years. Would like to take her there again. What a travesty to allow the developer to build another apartment building which will add to the destruction of small town life. We need to maintain the character of Madison including the movie theater and an arts center. Surely there can be another solution than to eliminate the movie theater. A place for an arts center would be a wonderful use for a historic theater. Tremendous loss for Madison and surrounding communities. I spent a good portion of my childhood going to that theater on Saturday afternoons with my brother and cousins. It should be preserved for future generations. Madison doesn’t need more condos. Thank you to whoever started this petition. The movie theater is such a lovely part of our small town and should be preserved and protected from developers. Madison Movie theater is a plus to the town. It brings people in to shop and take advantage of Madison’s fine restaurants. It has been a part of Madison’s History, my husband a lifelong resident of Madison, My children and grandchildren go to the movie theater. It has always been a safe, friendly place to go. Side bar…My daughter worked there as a teen. 🙂 The popcorn never tasted better!!!! My sister lives in Madison. I frequent often and live a town over. Don’t put condos. Keep quality of life for residents and for me another reason to visit Madison. i have been going to this theater ever since i was really little and i would hate to see it go… we don’t need any more condos!!!!!!!!!! Keep the theatre. Stop changing Madison’s history and small town charm!! the community deserves a theatre it wants to preserve! the theatre, with its long history, deserves to be preserved!! My husband and I love this theater and have been going there for the 30 years we’ve been living in the area. I was so sad when the theater closed! We had just been there the weekend before. Every good downtown has a theater. It brings people close by for dinner and ice cream. Save the historic theater and use it for a community arts and cultural center. A much better use than condos. Please save the theater it holds all of my childhood memories! Please save this valuable business of Madison and its surrounding area. Wholeheartedly agree with this petition, and I have seen this model work in other towns. Great spot for you to bring your kids!! We moved from the city to get away from the overdevelopment of neighborhoods and the condominization of communities. One of the things we love about Madison is its downtown. Building condos will be the beginning of its end. The movie theatre had not been maintained and was underutilized. If it is refurbished and a real push is made to make it viable it will continue to be a vibrant part of our downtown community. A place that college kids can go, twenty somethings, parents with their kids, teenagers and empty nestors. The community needs to rally to protect not just its history, but its core and what makes people come back to Madison or discover Madison for the first time, to live and raise the next generation. I have been in Madison my whole life and I have been to many movies brings back the good times. It is a big part of Madison. The beauty of Madison is that kids can be more independent of parents compared with a typical suburb. The ability to walk or bike ride to a movie is important. The theatre as been a part of the history of Madison for as long as I could remember. A downtown movie theater was a tremendous part of the charm of downtown Madison when we moved here. It is a shame we have lost it, and it will only add insult to the town’s injury if it is turned into overpriced condos. This building has been a fixture in Madison for generations, and is part of what gives the town its Main Street character and charm. Having lived in Madison and Florham Park all my life, I too share many fond memories of seeing movies there over the years. Shame it had to come to this. Judging by reactions over the recent announcement, I am certainly not alone in supporting rehabilitation and reuse of this building over demolition and redevelopment. I can tell you from years of experience advocating for historic preservation that anyone claiming there’s no choice but demolition just wants the inexpensive, easy way out. The structural issues should have been addressed before they got this bad, but they can always be repaired given the right developer and funding. Please reconsider the decision to demolish. Rehab and reuse instead. With that monstrosity off Kings Road and Green Village almost completed, do we even really need more shared housing development around Main Street? WONDERFUL theater in a college town. TERRIBLE shame it closed!! I go to the movies every week with several other senior citizens. It was convent for us, we would go for dinner at several area restaurants, which generated business for the town. Now we gave to go several miles in order for us to enjoy a movie…. Please bring back this movie theater, it will bring back the charm and elegance of this beloved town! Please keep this historical building as a movie theatre. This town doesn’t need anymore residential or commercial condos, nail salons or banks ! Thank you ! Madison needs to keep its small town feel and to preserve it’s history. I feel the town has already changed with that massive ugly structure on Kings Road. I know things change but do really need more ugly looking structures in town? We already have too many empty storefronts. I would love to keep the movie theater…it’s part of the reason we moved to Madison to raise our children! I also look forward to movie club in my own town. We need to save and rebuild a safe theater for our future! I saw my fist movie that I can recall at the Madison Movie Theater. Also my first date. Please save the Madison movie theatre it’s a landmark! We visit weekly with our family and friends!! It brings revenue to the other local businesses as well. Please save the movie theatre which brings charm to our community. It provides family and friend togetherness. 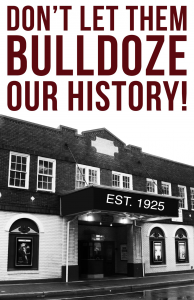 I have so enjoyed going to our Madison Movie Theater for the last 60 years and hope that this petition will bring this historic place back into our community! Please keep the theatre a theatre. Its great for families and the seniors of the community. It makes Madison special….. The theater is one of the things that makes Madison such a desirable town, especially for young families. History should be and needs to be preserved !! This theatre is part of the Madison historical legacy and should be saved !! The quaintnest of Madison makes it unique. It is a wonderful place where you can have a place to eat and shop and just enjoy being there. The movie house is part of that theme. Crowds and chaos don’t exist. If Condos are replacing everything that we enjoy then we may just stay in them and not venture out; like rats in there small spaces. A local movie house is so rare these days. It’s a treat. We need to preserve our historical buildings. Enough with tearing down and replacing. One of the reasons I came to Madison 15 years ago. It would be a tragedy to allow this building to be changed to non movie use…..
Keep the theater! Such an important part of keeping he kids safe and giving them something to do locally. So shocked to see the theater closed when getting off train yesterday. I wish AMC would buy it or something. It is nice having a movie theater only a train ride away without having to walk a far distance like you have to for Morristown. Having a local small theater is important to young families, and can also help support local businesses! Don’t force residents to the big theaters in other towns. Keep them local! We need a hometown theatre that all can access easily!!! Been in town for 40 years!!! The theatre was one of the main reasons we chose to live in Madison. We have enough condos already! I want my theater back! The movie theater is a vital part of Madison life. It is a key part of the community that made Madison our choice to live in and raise our child and it saddens me greatly to lose it. Save this historic building. Many fond family memories of going to the theater. Proud Madison Resident! Long Live the Theater! Went there growing up and took my kids there even when I moved out of town. It is a beautiful, cozy building and holds so many wonderful memories. Would hate to see Madison without it. This was my local movie theater for my entire childhood, and served as Madison’s Theater for several generations. It’s an historic landmark, and should be preserved as such. It should also remain in its own function as an historic landmark providing a small-town, personalized movie experience for current and future Madisonians! We are sorry at the loss of this local theater. It was one of the things that drew us to Madison. Please do whatever you can do. The theater is a treasure..it is a historical jewel and should be saved at all costs!!!! Please save the movie theater as it brings people downtown. It is vital for the downtown’s existence. Been going to his theatre for over 40 years. It is truly special. It is and has been a key part of our history and we still need it. Don’t let it go away!!! This Madison Movie Theater is a Community treasure. Should be preserved because of its history. It’s almost 100 yrs old and an integral part of Madison. theatres are being saved around the country this one deserves to be saved also. Most convenient theater I have been to. Small quiet and local is best parts. A downtown theatre helps define a small town community and helped drive my family’s decision to purchase a home in Madison four years ago. The presence of a movie house hearkens back to a simpler, more innocent time and distinguishes Madison from many other New Jersey boroughs. There’s so much potential for it to become a cultural center, and I, for one, would gladly volunteer my time and efforts in affording us an opportunity to save it. Many thanks for your consideration. It is a decision that will have a profound impact on generations to come. This theater should be saved. The amount of construction for transient living in Madison has reached all time highs. No more condos, apartments! Please keep a movie theater downtown. It’s the only place for entertainment of our kids right downtown that they can walk to! My husband and I love this place! It’s a great local venue. Hope it can still be around! Please save our movie theater! My sons attend frequently with their friends. It’s one of the things that makes living in Madison so great! An integral part of our town! Please bring back the theatre! We badly need a cinema in this area. This should be it. Keep theater open! We would not have let the sale go through had we known your intentions. We love the theater. It is central to the community. Fix it up and keep as a movie theater! It brings people to Madison and helps support the local restaurants! It would be a same to loose such an important part of our downtown!!! My first movie without my parents, my first real date, and many other precious memories! Everyone should sign this petition especially those of us who grew up in Madison and have fond memories of going to the theater. We are already missing this theatre. Downtown will not be the same without it. It’s a big loss for Madison. Save the theater! Such a big part of the history of Madison. I grew up in Chatham and have been going to the theater since I was little. I then brought my daughter. As my daughter got older, it was a safe place I could drop her and friends off to watch a movie. It’s nice to have a local place to go to watch a movie. Love this place. Open it up again and let’s build on the culture of Madison, not benefit a few wealthy property developers. My kids love coming to the movies there! This theater has changed my life many times. It would be a tragedy if it were to be demolished. Please keep this wonderful theater, it’s the main reason our family comes to Madison! Please save Madison’s historic movie theater! It’s such an important structure and needed in our community! My family has been going to the Madison Movie Theater for years and it would seem horrible to knock down an historic building to put up condominiums . The theater is a part of what makes Madison a special community and an important part of the downtown business environment. Please focus the municipalities’ abilities on encouraging/keeping it a movie theater. As a 1964 graduate of Chatham High, I feel that the Madison Theater is an important part of our local history, and it should be preserved. Keep this landmark alive. The movie theatre is great for kids and brings culture to downtown. Save this movie theatre and preserve one of the reasons people live and shop in this area. The Madison movie theater has been my hometown theater since I moved to Chatham. It was a great place to see first run movies. I loved it, because I didn’t have to travel far. The theater has been an important part of my life in Madison, full of many memories. The idea of it being gone and the new generations in Madison not being able to create similar memories there is greatly upsetting. Please take a look at the Englert Theatre in Iowa City – saved by a community effort and now central part of community life. Save the Madison theatre! No more condos! Some form of an arts center would be an ideal use for this building. Please, we do NOT need more condos. WE need this historic theater preserved as a place for residents to enjoy and participate in the arts. You cannot eat money, but you can consume the arts and history. DO not let this theater be demolished! Unthinkable that Madison would lose one of it’s staple institutions. This would be a major blow to downtown Madison. Save the the movie theater! This will be an enormous loss for our community. It just won’t be the same. I implore the owners to please give the community a chance to make use of this property in a way that will enrich us all! We have felt its lack already several times this summer. And we already have enough fancy condos coming in! Our family loves Madison’s movie theater – a staple in our town. Losing it will be such a loss for all of us. Please protect it… for our town’s economy, its charm, our children, and for the historic feel of our beautiful town. As a Chatham native, I have many fond memories of movie going to this lovely theatre. It would be so very sad if it were torn down. It is historical and lovely and should be used for arts events. Condominiums on this street look horrific and be totally out of character with that street and neighborhood. Soo important to have a downtown venue!! Born in Summit, and raised in Chatham, I request Madison Theater and its building be declared a Heritage Site: an outstanding structure which deserves special protection; a building which could continue to benefit the community of Madison and its neighbors, as a gathering site for all generations, as an arts center, supported by volunteers and benefactors. As a long-time citizen of Simi Valley, CA, I voted for the tax-funded conversion of a (in succession) church/synagogue/funeral home, long vacant, into our Simi Valley Cultural Arts Center (www.simi-arts.org). Is it not up to Madison’s citizens as well as its Mayor and Council? Petition to put this to a vote. It worked for Simi Valley; it could well work for Madison. Vote in favor of your community and its needs; preserve your history and provide a center for your citizens. Please keep the theater! It’s such a great part of the town. Many happy memories in that theatre . It is a piece of history to be saved. Once it is gone it will never be again. I love the Madison theater, and it would be terrible if we lost it because it’s so convenient for kids when they want to hang out with their friends in town and parents feel good about letting their children be by themselves because they know it’s a safe environment. The theater is a wonderful addition to Madison’s lovely downtown, as well an incredible piece of the town’s history. The Madison Theatre was my first job as an usher. This building holds so much sentimental value to me. Please do the right thing and keep it, find parking, financial support and vision to save it for future generations. Nothing beats a small town theater. It keeps the vibe and spirit alive. Figure out how to get some more parking and it will be a hit! This movie theater is too important to close. It is integral to the spirit of Madison’s quaint/ charm of a small town that still offers much to experience during your stroll. Save it, it is imperative ! Love this place, makes Madison more kid friendly and family oriented! Please save our little theater!! What a terrible loss for everyone! Please let’s ban together to save this. PLEASE preserve this community treasure! It has brought culture and enjoyment to Madison for 90 plus years. We loved going to the madison movie theatre. Miss it. Madison does not need more condos. Save this historic building! Please do not take down the Madison Theater!!!!!! This theater is too important to the Madison community to be allowed to close. More people are seeing the advantages of communities such as Madison so I foresee a bright future for the theater. Madison is one of the few remaining communities that demonstrates its commitment to its citizens and the arts in its focus on balancing commercial with creative and historic interests. Demolishing a historic building like this is not in keeping with that Madison Commitment. In addition, the location of the proposed condominiums would create problems that would begin the demise of what makes Madison special….we need to learn to be wise enough to just say no before it is too late. The theater provides a wonderful down town opportunity that is missing in many other communities. Please do not let Madison become just another town. Please keep wholesome culture and entertainment available to the people of this area. Big corporate-style theaters are impersonal and overwhelming. This was a gem in the heart of Madison. Please keep the theater in Madison. It fosters the type of community we want and provides kids quality entertainment. I love this theatre and have been going here since I was a kid! GREAT little theater, lots of history there. Save it! I have lived in Madison for almost 40 years and seen the changes downtown and throughout our town. A community not-for-profit space would be a real plus, if funding could be found. Do not tear this solid building down. Repurpose and reimagine….but not destroy history and an integral piece of the charm of Madison!!! What is it going to take to keep the hometown USA feel in Madison, it was one of the many reasons I live here. Nothing better than walking to the movie theater than enjoying a bite to eat at one of our fine local restaurants. This is so important to the community! This is an important piece of history and needs to be saved. We were very sad when we heard the Madison theater close and sign on to wanting a new operator to resume showing movies at this location. We have seen numerous movies here both with and without our kids. I saw my first movie here as a child–Cinderella–when my aunt worked there. This is where my daughters saw their first movies. It is so nice to be able to walk down the street to a movie! I grew up in Madison. This is such a historic building. It must be preserved. Please keep our downtown historic district intact. It’s one of the things in Madison that make our wonderful town unique. Don’t destroy the small town look and feel of this great place. Thank you! Really sad we are doing this!!! Do you not think we have done enough damage, with Green Village school??????? The movie theater was definitely one of the reasons we originally chose to move to Madison. I have since been taking my kids there for years. Loosing it makes us less competitive as a town for potential new homeowners. It is amazing what a small group of committed individuals can do to preserve our sense of place and our home in Madison! This theater has always been a great place to see movies locally. At some point we need to find a balance between preserving what makes our downtowns special and simply making money. I would be very sad to see condos take the place of this theater. Save this historic theater. It draws people of all ages which is healthy for a thriving downtown. It’s been loosing customers to Morristown theater’s comfortable chairs. Perhaps switch out the seats and I’m sure more viewers would come. It’s worth it to preserve this valuable site rather than loosing it to condos. It seems like just about every house that goes up for sale in Madison gets torn down and the same cookie cutter house design goes up (and now a helipad at the Jets complex) it seems this quaint town we chose to raise our family in is not so quaint anymore. The beauty that makes Madison stand out as the “town you want to live in” is quickly disappearing. We had quaint and unique shops with homes that had that old character feel to it, with our own movie theater!!! Now…. noisy air space and lack luster homes going up with a downtown filled with nail salons and banks. Can’t we be uniquely different from other towns. I am 5th generation Madisonian .This building was a part of our family . Many friends from other communities often speak of Madison’s great downtown venues and the movie theater which to many seem to be one of the areas best kept secrets. Let’s keep it alive and well. I’ve enjoyed movies there for many years. This is a great theater, and needs to stay. I grew up in this theater its where we always gathered growing up in Madison! It’s part of the town’s history. We need to preserve it, to much has disappeared already (such as the monstrosity going up down the road) I have heard that we need to revitalize downtown., that is bs.. people stay in Madison come to live in Madison because of the old town feel. Destroy that and you destroy the core of what we love best and we would be just like every other forgotten town. Help Madison retain it’s small town charm. Save the movie theater!!!!! It’s a real jewel for Madison. Madison is Destroying ALL of its History. Ongoing Removal / Demolition of our Historical Properties and Replacing them with Condos, New Stores, etc; is Evolving Madison into a NOT so Historic, Quaint Town. The Beauty/Attraction of our Town IS its Quaintness. Over the years I have seen SO many of our Landmarks, etc; Fall to a Modern Impact. I know a town has to Grow and Progress, BUT, too much Progress is Ruining our Town. It is SAD. This theater is one of Madison’s most iconic features. The Madison movie theater is a historical landmark of the small town in which has had many movies made. I moved to Madison on August 1, from the Princeton area. We enjoyed current foreign and independent film at the Montgomery Cinema,. Please contact me in your effort to save the Madison Movie Theater: So much potential! There are so many smart reasons – both economic and cultural ones – that make the effort to save the Madison movie theatre an important one! And one of the most important aspects of this effort is the desire to retain Madison’s special character and beauty and history – a new, ugly condo complex would be a disaster in that location! Local flavor is precious, and we should fight to keep it alive. Doesn’t the town slogan say we should shop Madison? Going to a movie theater brings those people who will shop downtown. I loved walking to the Madison Theater–and seeing so many local families and teenagers there. This is small town USA! Let’s preserve Madison’s theater and Madison’s charm. I am from Chatham and as a kid we loved coming to this movie theater! Let’s redo it and make it greater! Please bring back our local, important movie theatre!! For 36 yrs., we have been seeing and enjoying big screen movies in wonderful Madison, NJ!! It’s terrible that it has closed. Shocking . Hurtful to me and our surrounding communities. Please keep the building and restore our theatre!! We love this movie theater and we’re frequent visitors to it on the weekends. Please preserve history and such a great entertainment venue for the community to enjoy. My husband, son and I are Madison Residents for over seven years . My son saw his first movie at this Theater. Over the years we enjoyed going to the Madison theater monthly. Save the Madison Theater! Not only does it have history, but it has memories for my son and I.
i loved this theater and it was so convenient to go to!!! It’s heartening to see our family’s not alone in mourning the theater’s closing.. Is there a way to signal the community’s enthusiasm to any potential developers? Why get rid of such a social part of our community? It doesn’t make sense! We love it, families love it. It is an important part of Madison. So upset about this! Great place for entertainment and keeps kids out of trouble. On the last day that the theater was open I went to go see Pirates of the Caribbean. I wanted to go see it again with a friend of mine and then I saw it was closed! It made me really sad. This theatre has been a part of the childhoods of so many Madison kids, including mine! It was a rite of passage to be allowed to walk downtown to the Madison theater with your friends or go there from the Junior School. It is one of the things that makes Madison a special place to live. With all of the seemingly unchecked construction going on in Madison and the surrounding towns we are losing the elements that made Madison so cherished as unique. Would love to see another movie theatre go in there but if not, at least save the building for some sort of performing arts or community use. Madison is losing its hometown feel and we need to preserve what we can! Great memories there. Enough with the condos! Madison needs to keep its quaint, small-town atmosphere. There is a similar movement in Flemington, NJ, in which a developer wants to demolish the famous hotel in the middle of town. Public interest can make a difference. So many wonderful memories from this theater. Please preserve this building. This generation is too quick to build up new developments and tear down landmarks. Save the Theater. Don’t let Madison loose this historic movie theater to build more condos. Hoping it’s not too late to appeal to the town to maintain the theater downtown. It’s been such a big part of our local lives, between having birthday parties, outings with friends and family nights in town. Its existence helps round out the entertainment offerings, with the museum, great book store, gyms and restaurants. It would be a huge loss to lose the theater. Give our children a safe place. I just moved to Madison on July 1st, partly because of the great downtown and Americana vibe it has. The movie theater is a huge part of that and I’d hate to see it go. I’m sure many Madisonians (including myself, now) would be willing to put their funds together to resurrect this amazing theater. I’m a 3rd generation madisonian and soent my whole childhood in this town. I’ve had many childhood memories of hanging out downtown and going to this movie thearter. It is one of the reasons we as kids spent so much time down town. This is so many kids childhood, we grew up asking our parents if we could get dropped but off at the movies and it was considered the coolest thing in the world once we were allowed to go by ourselves. Our parents trusted we would be okay because they know how special that movie theater was to us. I’m older now but when I heard it was closing I felt like a piece of my childhood memories was just going down the drain. So many fun play dates, that turned into actual dates happened there and this might sound “dramatic” because it’s “just a movie theater” but Madison is such a family oriented, friendly close nit town and to see something that really made all those families and friends gather up for a fun night or day just go away, is heartbreaking. We love the theater and want the building to stay!! I grew up in Madison and went to this theater often. The theater may be gone but please save the building. It is Madison! And can be used for so many worthwhile community events. No more condos…please preserve the history of this wonderful town! We don’t want to see such a beautiful and historic place go, especially of something with such historic significance. We all love and appreciate the Madison Movie Theatre. Please do not tear it down!! Please bring back the theater!! I grew up going to this movie theater, i still want to enjoy it. Under the current configuration is a wonderful, classic theater waiting to be brought back to life. Preserve it! I have many fond memories of the theater from the 60s and would like to see this bit of history preserved for the town. The theater is part of Madison’s culture and heritage. It should be here for our future. One of the few places where Madison kids can walk to themselves! We love the theater, please don’t destroy it! To lose this building would be a real shame. It’s part of the landscape which shapes our lovely town. Please save our theater. ! !’it’s part of our towns history! We could renovate the inside and make it similar to the AMC theater in Morristown . With the rise of condos , townhouses (kings road). Coming to Madison. It’s in our best interest to keep our theater!! PLEASE! That theater is an institution. I live in Chatham but always frequented the Madison Theater and food establishments either before or after. More condos..c’mon! Don’t regular people’s lives and enjoyment count anymore? Me. Conley, I know you will try and do the right thing here. Closing the theater is such a huge loss for Madison. The not-for-profit center is one of many great ideas circulating. Let’s keep our Madison “special” and not jump on the bandwagon of overdevelopment. This must be done….and think of the centennial celebration in 2025! For so many years, the movie theater has been one of the charming and convenient amenities that has made Madison such a special place to visit or raise a family. Community gathering locations are vital to a happy, healthy, thriving community. If we lose this endearing and important public space, all Madisonians and area residents will pay the price. Let’s find a way to keep the theater part of Madison’s future. Let’s preserve this historic theater instead of adding more condos in Madison! While I do not support ongoing funding for the theater from the borough, I do support one-time emergency interim funding that will give citizens an opportunity to develop a plan as an alternative to condos. So many great memories during the 60’s of my friends and I being dropped off by our parents and, after the movies, running across to the Train Station Phone Booth(!) to call and be picked up afterwards. SAVE THE MADISON THEATRE! I was sad to hear this theatre was going out of business. I moved here 6 years ago and one of my favorite things about Madison is this theatre. This theatre is an important source of family entertainment for our community. I been attending movies with friends at this theatre for over 30yrs. I hope the developers will consider a plan to continue to use this as a movie theatre. I’ve enjoyed watching movies there since I was a kid. Please, we don’t need more retail/residential in the community. Please save the Theatre. Madison does not need more condos! Bring back the beloved movie theatre!! It is such an important part of Madison’s downtown and is already missed! No more condos.It is a great place to see a movie. The theater is a great place for families and when you see all the familiar faces at a show, its a great sense of community. The movie theater helps make Madison an attractive, walkable community. Such a valuable resource for our community. One of the reasons I moved to town! The movie theater on Lincoln Place is an integral part of our downtown. Madison is an attractive place to live largely because of its historic, vibrant, and walkable downtown. Losing the theater, on top of the vacant store fronts on Lincoln and Waverly, could be the tipping point that sends our town into a downward spiral. Please save the theater. I presented a plan to the save the theatre as an arts-based space and was shut down by both the real estate agency and member of the local government. I appreciate those organizing and supporting this petition…save the theater! The theatre provides a place for families to enjoy movies together as well as being one of the only places for kids in Madison to be entertained. Certainly a loss for our walkable/bikable town. Having a movie theater in your town is essential to the preservation of art. Small towns such as Madison should have theaters to introduce young children to the world of cinema. The fact that Madison has its own theater that kids and families can walk to is part of Madison’s charm! There’s no need for another over-priced restaurant or high end condos. How about we do something for the current Madison residents, including the kids that live here. If we do not protect our communal history, we lose our collective knowledge of who we are and from where we came! I salute all involved in this effort. Semper Fi ! The movie theater is a necessary part of our community, and losing it would make us lose a lot of culture for our town. Also, it would provide less reason to be in downtown Madison. Please Please Please preserve our Madison Theater. It is a treasure. Wholeheartedly support this important effort to preserve our historic landmarks and community-centered experience for current and future generations! It’s time to stop tearing down historic monuments in this country. Save the Madison Theatre! Don’t tear down the Madison Theatre. Please do not turn the historic movie theater into condos. That would be terrible. I have always enjoyed the convenience of going to the movies at the Madison Movie Theater and feel it is a wholesome family presence in our town. Also, it encourages patronage at local restaurants and businesses. We love the Madison Theater. It’s a great family theater and serves an important role in giving Madison it’s small, hometown feel. We always felt comfortable letting our 14 year old go the the theater with her friends, stopping next store at Romanelli’s for pizza and heading to McCool’s for icecream. Losing that opportunity is really sad. We live on the Convent Station side of Kitchell Rd but have always thought of Madison as our town. We frequently patronize the shops, dine at the restaurants, shop at the Farmer’s Market, watch the parades and Christmas Tree lighting, and until recently, gone to the movies. Please save the Madison Movie Theater. Thank you. A town without a movie theater doesn’t feel like a real town. Don’t let this historic building become a pile of rubble. This movie theatre has been around through both my dad’s childhood and my own. We both have many memories there and believe Downtown Madison won’t be the same without it. Great memories for my family there, very disappointing to see it close. I used to hang out around this theatre all the time….my first date was here and I had many fun times….hopefully it will stay open! With what the Pope would call the sinful wealth of Madisonians, one would think the least they could do is preserve their heritage. A beautiful landmark in Madison, it only adds to the town’s character and is part of its history. Removing for a condominium development is probably the worst reason to close it, and would be turning Madison into something no one wants. The community wants it, so keep it! You got rid of one arts center, let’s make the theater a new arts center. Great opportunity for the Madison and wider community. This movie is a staple of our community. Please prevent this from becoming a condo. I loved having my kids go downtown on their own to the movies! It made Madison so special. We don’t need more condos, we need to keep the community feel of Madison. I found great joy and hold fond memories in the Theater from my early childhood through early marriage years. I realize economic exigencies will not permit the structure to continue its former use. But surely a higher and more enduring benefit can be found than condominiums. Please strongly consider continuing the benefit of our mutual heritage. What a horrendous idea…it is such a nice theater…spent many happy times there as a child, a young adult and an adult with children. Bring back the theatre! Felt great to know that we could send our kids to the theatre in a safe community. Saving, restoring and redeploying the Theater makes good economic sense, as well preserves a cultural, historic community asset. We recently moved from NYC to Madison and the movie theater was one of the things we loved for our kids in Madison. Keeps them safe, yet independent and provides a safe fun for them. To remove it would be a true loss to the entire community and change how i feel about downtown Madison. The theater is an important part of the community and character of our town. Please reconsider the decision to knock down the theatre. It was such a nice aspect of our town. Please save this historic building as a part of Madison’s history!! So sad to lose such a gem. Every town center should have a movie theater. Loved this theatre no only for convenience but for the teens in the town for meetups and something for them to do. If Madison is truly proud of its heritage, we must preserve it. Generic suburbia is all too common, and what makes a town unique is its commitment to its own uniqueness and sense of community. Public spaces most definitely represent such commitment. Generic retail space is not, can not, and will not be the same. This is one of the few places our kids could go on their own in this town. This movie theater is part of Madison’s charm! I believe we need to protect the historic places of “Small Town America”. My kids love going to the Madison theatre. Don’t want to lose our small local theater. This theater is a wonderful way for the community to be together. My children were raised with the theater and it means so much to so many. The Movie Theater is an integral part of our downtown. To lose it will surely have a devastating effect for the remaining businesses in our downtown. Not to mention the great loss to our community. The school I work in had to change a movie trip to Millburn….all that lost $ from ticket sales & the 75+ lunches we didn’t buy in town! This is such a special part of our town! Do we really need more condos? The answer is NO! Trying to make Madison into a Little Morristown is crazy. How about trying to get business into the area by filling up the empty stores? How about reducing traffic & the burden this will put on the school system & extracurricular activities? How about keeping the small town charm that made Madison so great to begin with? The townhouses/condos on Kings Road is more than enough. Rethink your vision for Madison! This is a childhood memory that I treasure. It brings back wonderful times. Please save our history. This is a historic building and should be preserved! I miss the theatre so much. We don’t need more condos or apartments. The theater was such a great place to hang out and without not many will be will to move into new built condos. Do not turn our borough into an urban town. Will pay more for ticket prices. Please reopen our theater. We luv it and were frequent customers and would be again!!! Please save this theater. It is one of those iconic parts of the the town of Madison that makes it such a unique town. My students absolutely love the movie theater. We are a world of progress which is incredible, but please don’t lose that small town vibe. During my 40 plus years of living in Madison, I experienced the joy of walking to this historic icon to enjoy the movies on more occasions than I could possibly count. It would be a community tragedy to lose this building. Our family loves Madison cinema!! We’ve been long-time supporters with our money, not just in spirit– hoping our kids can continue to have this great option for them right downtown. As I lam a fifth generation Madison resident, I would like to hold on to this very important piece of Madison history. This building has meant quite a bit to me and family members past and present. Our town was voted one of the quaintest towns in New Jersey and that is because of our rich history, Madison’s hard work from our town workers, plus our fire and police department and emergency squad all add to this safe and beautiful environment. The Theatre is located for many of the Madison residents to just walk to, or for out of town people to just hop the train, to see a movie. Let’s keep Madison rich in history with the ascetics it deserves! Please save the Madison movie theatre and our building history! Let’s find a way to retain at least some of the elements of this small town gem! Fond memories of going to the theatre 50 years ago when they had one screen! Would hate to see it go away! Madison needs this! As someone who was raised in Madison and come from a multi-generational Morris county family, and have lived in multiple cities and towns since – when returning to Madison to visit family I realize how little culturally Madison has to offer. 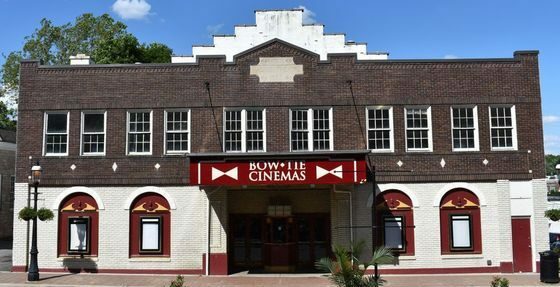 Drew University is an oasis, however, with the closing of the only downtown movie theater and not a lot else going on, reviving the historic Madison Movie Theater would be a massive add to the town’s offerings. It would be amazing for it to take on a non-profit model rather than be turned into a cookie-cutter Lowes or AMC theater. Theaters such as the Brattle Theater in Cambridge, MA and the Castro Theater in San Francisco are great models of sustainable theaters that offer a wider variety of programming with appeal to a large audience, and have become a destination for film lovers from all around. Save Madison’s downtown from the monotony of generic architecture, the destruction of history and culture, and housing projects that create expensive rental and ownership opportunities that really only benefit the owners and the politicians that received a little something to help grease the wheels. Please look towards making Madison even better! This movie theater is and has been a real gem for the town of Madison. It adds so much to the charming character of the town. A movie theater is a great way to provide activities for families and all ages. Many people do not feel comfortable nor want to drive to the large magaplexes in other towns. It would be a shame to lose this vital part of Madison, a town I have loved since I moved here. PLEASE SAVE THE MADISON THEATER. IT IS A LAND MARK.. DON’T WANT CONDOS, FOR SURE. historic building bringing character and family enjoyment to Madison. Please keep this beautiful landmark that is an integral part of the fabric of our town. You can improve upon it, make it even better I’m sure! The movie theatre is an extremely important space for our community and youth. Please don’t let us lose this hallmark of our town. It will make our town bleed out even more. Enough with overpriced condos we need more arts centers and preservation of the historic character of Madison. Profiteers are ruining our town. This building is an important part of our community, and its services are already being missed by residents. Plus, let’s be honest – driving to Morristown or East Hanover just for the sake if watching a movie isn’t fun. Please save our theater! My first job was there! The building is literally the heart of Madison, and the space could be used in a variety of ways to further the downtown revitalization vision. An arts/culture/theater and public performance space would be great for the town and draw in outside revenue. This effort dovetails nicely with the Downtown revitalization initiative. It’s about quality of life in our town and deserves some creative thinking and bold solutions. Please keep the Madison Theater open! It should be preserved as part of the history of our families’ entertainment. I live walking distance from the theater and think it brings a charm to our community that nothing can duplicate. Having our kids to one day be able to walk into town for a movie is priceless. I would go to this theater at least once a week. I loved that it was not a gigantic theater. I liked the small town feel of this theater. I miss going there. The movie theater is a Madison staple, cherished by so many residents! Please please keep it! Have lived in Madison most of my life, grew up here, remember the excitement as a boy of walking by myself to go see a movie there on saturdays! I was making plans to go see some movies just recently when it closed! Please save this building/theater, to me, its iconic and central to the Madison downtown shopping district and should be preserved so future generations can go enjoy a movie there as I did as a young boy! Madison always had a special small town charm especially with a family movie theater that our family regularly visited when my children were young. Now my teenagers will miss hanging out there with their friends. This theatre was part of our community for many years and should remain in town for future generations. Keep the movie theater in town so our families and children can enjoy our town. Sad to see the movie theatre close. Too many times people are short sited about what makes a community where people live, work and play! We should preserve our landmark buildings and maintain the unique character and charm of Madison. Please keep our favorite place that’s been apart of our families lives for years. The property should be bought by the town and renovated as a performing arts center. This would generate both revenue and culture for the town. I worked at the Madison theater when I was in high school in the 1980’s. such a classic place. Preserve it!! Totally agree with petition. Should be designated an historic landmark and town should work toward that end with new owner. Consider leaseback or other arrangement with town advancing funds. I am so upset about knocking the theater down. How can we let this happen. What is becoming of our charming little town. The memories I have of the theater with myself and my sons and now my granddaughter are going to be taken away. How sad for future families. I loved this theater and was so sad to see it close!! Please yet to keep it a movie theater! We don’t need more condos we need entertainment!! Please try and save this special building! I live in Chatham, but you can count the four members of my family as supporters of this theater. We went there frequently, and will miss it a lot.